Sir Brendir is a veteran knight in a time of petty wars between feudal lords. At any given moment, one ruler might reap the rewards of conquest, but on the whole, everyone suffers. Brendir has had a storied military career, but, tired of the unceasing warfare, he moves north, unbeknownst to anyone save a select few he brings with him. This is basically a glorified eye-candy map or free-build. I wanted to make a peaceful village in the woods, so that's what this is. The map is geared purely toward having fun rather than being challenged. The objectives can give you some direction in building up your town, or you can forget the objectives and do whatever you like. The map was grand for what it was meant to be: an economic scenario bordering on freebuild. There was a nice balance between decent starting gold and low food supplies for your large population that meant you had things to keep you busy and keep the town running despite it being a laid back scenario. No technical faults that I could find that made the map unplayable or difficult in unintended ways. Well, I had to think a bit before putting this number in because, while the map is in the 'Economic' section rather than freebuild, it seems to be geared more toward that freebuild-style play. I'm not a very skilled Stronghold player and I achieved all the objectives by January 1137, however I understand that this map was supposed to be easy so I'll give it a middle of the road score for balance. I really liked the story of a peaceful setting where an old retired warrior can sit down and take a breather from all the chaos. The terrain design was good with regard to the shape of the hills and the settlement itself. I really liked the town's layout, and I can tell the designer spent a lot of time on things like the stream next to the village, the shrine on the hill, and the positioning of the starting buildings so that they were not too close together and yet were not so spaced out that you could have room to build a giant city in this little map. I do think that a little more variety with tree types might have been good, but as I assume this map is set in a specific geographical environment (the British Isles?) I won't pick on that too much. There was no readme with the map, but for this kind of scenario it really wasn't required. The story provided here and in the map description in-game was short and simple, and at no time did I feel lost or confused about what to do to achieve the goals. Additional Comments: A very good map. I love peaceful, slow paced scenarios like this and this map was a perfect example of something that can provide a nice break for the battle-weary stronghold player. Well done, and thanks for making it. No review, at least for now. "Hear what comfortable words our Saviour Christ saith unto all who truly turn to Him: 'Come unto Me, all ye that travail and are heavy laden, and I will refresh you.'" This is as comforting as those words are to me. 1) It is so densely forested - and more importantly, the terrain is very uneven. This does add to the atmosphere, and I understand it was really made to be an eyecandy. And it does. But it does make it difficult to add buildings as you wish, where you wish. 2) Why did you include pitch? I see three places to put pitch rigs; I could place none in any of them. Besides, there's more wood there than you could use in a lifetime. Both of these distract somewhat from this otherwise very, very sleepy village and its very, very casual goals. Still, it is an enjoyable map. This is a strange game, you start with adequate resources, troops and buildings, and just glide easily towards final victory. The game is easily playable, and unjustly so, nearly forgettable for that very same reason, You play once, with guaranteed success, so why play again? The game is rated as Easy and it certainly attains that criteria. Timballisto has created a game that lets you sit back with your feet up and view your game with the occasional input from the player. The temptation may have been to beef it up with higher targets and scripted events of a few bad things, but that defeats the authors aims of this game. The map is a good representation of a vastly wooded valley somewhere, I suspect, in the middle of Olde England, somewhat similar in appearance to Sherwood Forest. 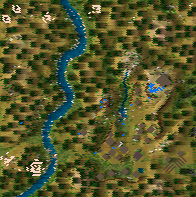 The stream and river running down the map are realistic in appearance and break up what is a large forested gentle hillside. There are limited areas of the map to place additional buildings or farms, due to the very uneven ground, A few marshy pitch plots also dot the area. The author appears to have taken care to ensure that the game play is not made ultra easy by skillful use of the editor tools. There is nothing wrong with this type of game, if the aims were targeted to achieve happiness and harmony as well as resource based goals. There are a few errors inside, such as why do I have stables or pitch rigs , braziers and the ability to dig moats, none of which are used . Removal of unwanted/unneeded items from the players choice is such a little thing to check for, unless I missed something and they are needed in someway? On a positive ending, the game, I suspect, played as well as the author intended and as such he has interpreted his game plan as best as can be expected. Overall this was a fun, easy paced game.